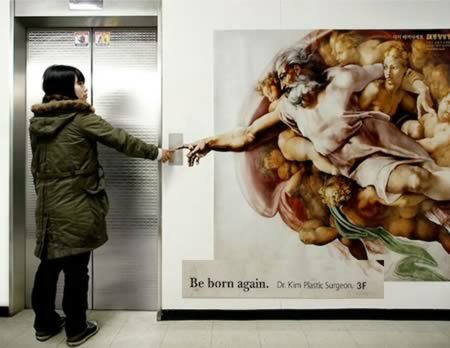 Be born again, proclaimed this clever ad by Dr. Kim, Plastic Surgeon, with a clever use of Michelangelo's The Creation of Adam. All you have to do is push that button to the third floor. Who needs a fairy godmother, witchcraft, or even a royal kiss when you've got plastic surgery? 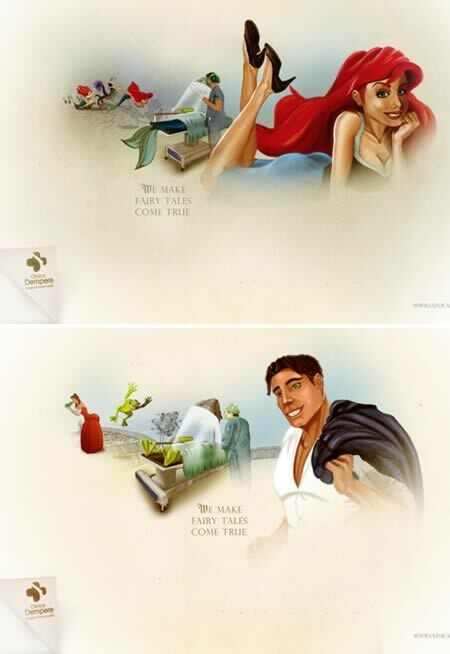 These "We Make Fairy Tales Come True" ads by Clinica Dempere in Venezuela cleverly spoof Disney characters. The ad says: “The only thing you should worry about is how to explain it to your children”. Note: This advertisement has been circulating on the Chinese internet and is attributed to a Hong Kong cosmetic center, probably because of an incorrect post on a popular Hong Kong discussion forum. 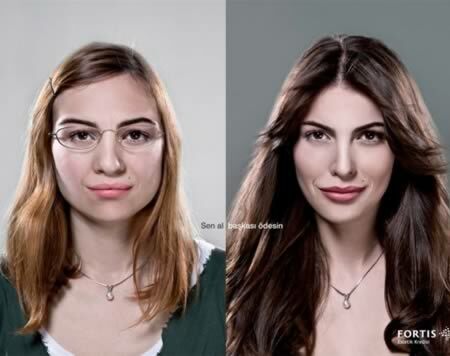 However, the ad actually originated from and belongs to a plastic surgery clinic in Taiwan. 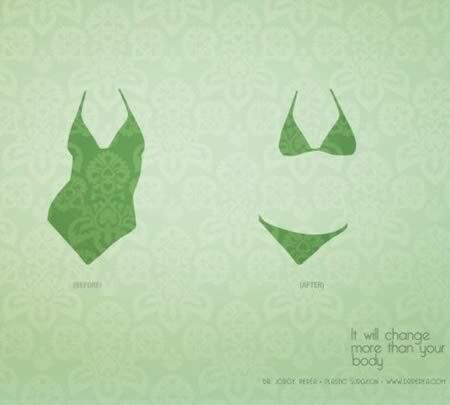 The Print Ad titled "Bikini" was done by Mccann Erickson Bogota advertising agency for Plastic Surgery by Dr. Perea, Plastic Surgeon, in Colombia. It was released in June 2008. Unique twist for a business card. 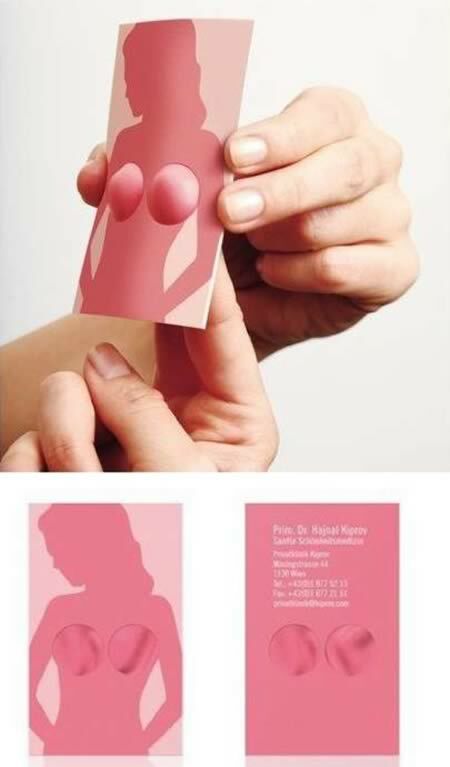 Dr. Hajnal Kiprov demonstrates his services for breast enhancement through two rubber inserts in the card. It shows what kind of results that can be done by using him as a Plastic Surgeon …. creative. The now liquidated Advanced Cosmetic Surgery company caught our attention in the year 2000 with nationwide billboards featuring the surgically-enhanced naked body of its MD, Halina Ashdown Shiels (48), grandmother. This is her standing in front of one of them in Donnybrook, Dublin in February that year – before the company collapsed amid debts and controversy over the death of a mother-of-six in recovery following surgery at one of their clinics. 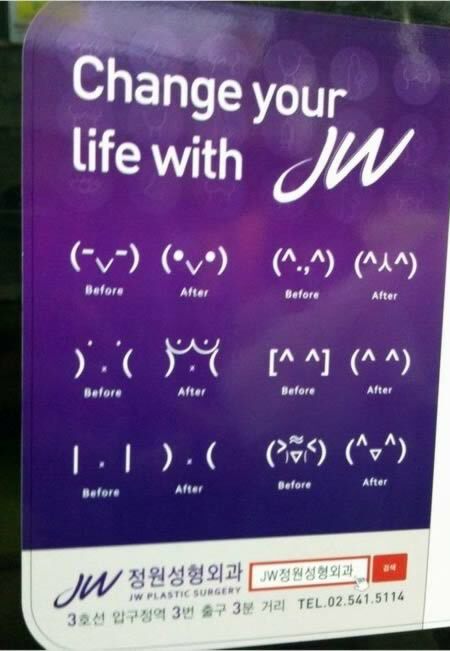 Creative plastic surgery ad using emoticons. 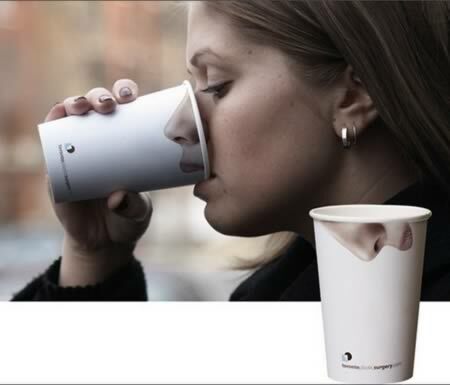 Plastic Surgery Ad on Cups. An old one but it had great impact when it came out. It was created by DDB in Toronto. “You get the credit, someone else pays for it.” Very truthful plastic surgery loan ad. Advertising Agency: Gram ?stanbul, ?stanbul, Turkey. 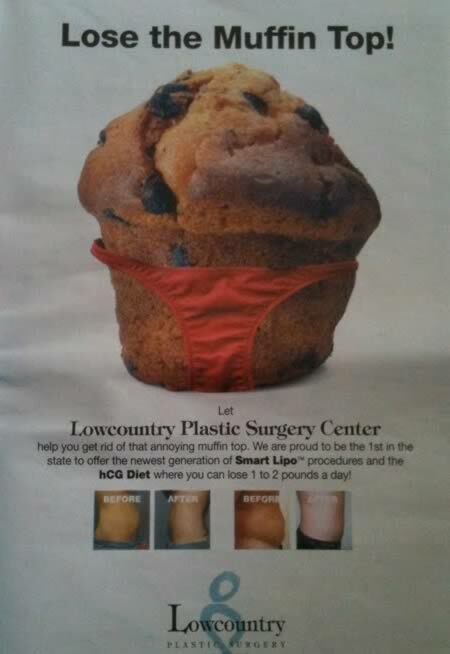 Newspaper ad for Lowcountry Plastic Surgery.